Piso Fare Promo 2016: Summer is almost over but here's the good thing with Cebu Pacific, they are still offering affordable plane tickets to some domestic destinations. If you hail from Zamboanga, you may plan to visit the Queen city of the South, Cebu. If you are based in Manila, you can take an international flight going to Singapore or Fukuoka. Of course, there are still cheaper fares going to Boracay via Caticlan, Dumaguete or Puerto Princesa. Tokyo is just hours away if you are based in Cebu. So what are you waiting for? 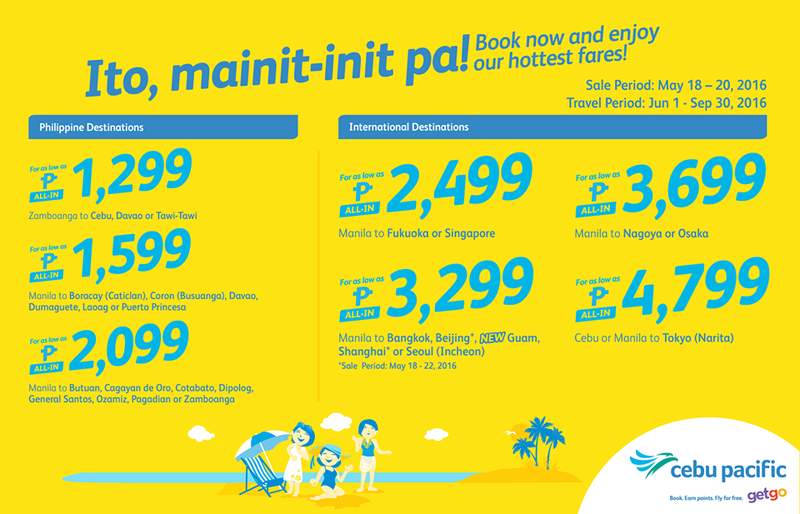 Take advantage of this hottest fare by Cebu Pacific. May available pa po bang slots for 4 pax papuntang coron? Salamat po.